A portion of Buffalo Creek Road, just past Young’s Mountain Drive coming from the south, has washed out. That section of the road is closed. – Note that Buffalo Creek Park can still be accessed from the south by turning up Young’s Mountain Drive, going straight at the next stop sign onto Village Road, and then turning left onto Chalet Road. – You can then turn right at the next stop sign to get back onto Buffalo Creek Road. The trail parking lot will be on your left in about 1/2 a mile. – It could be a while before the road is repaired, so please use this route to access Buffalo Creek Park until then. – This route will only take you a couple extra minutes. FOR THE LATEST UPDATES SEE TOWN OF LAKE LURE. Park Highlights: The park was designed for mountain biking with switchbacks, berms and rollers for jumping, but it is a multi-use park ideal for hikers, trail runners and nature lovers too. This is the only bike trail system of its kind within 20 miles. When fully developed there will be 10 miles of trails, with this first phase being a 3-1/2 mile loop. There are multiple creeks along the trail with well-built bridges to walk or ride over. Along the way you have many views of Lake Lure and the adjacent Young’s Mountain. With every step up the trail these views become more majestic. About half way up the trail you will also encounter a huge boulder field that may very well become a popular #climbing spot as we met two guys that were out there for that exact reason. All in all, the trails are very well made and maintained which makes this a must do trail hike or ride in Lake Lure, NC! Map & Directions: From the Lake Lure Beach, head east on Memorial Hwy. (Hwy. 64E) for 6.1 miles then turn left on Bill’s Creek Rd. Stay on Bill’s Creek for 1.9 miles and then turn left on Buffalo Creek Rd. In 2.4 miles, Buffalo Creek Rd. will take a right hand turn into Rumbling Bald Resort – turn right here. Stay on Buffalo Creek Rd. for an additional 1.9 miles, passing by the Resort and going up beside Young’s Mountain. You will see a Rumbling Bald sign on the left side of the road. The parking area is just passed the sign on the left side of the road. Trail Challenges: Other than an increase in elevation, there are no real challenges to hikers. There are no tricky creek crossings as bridges are constructed over them and the elevation change does not get you that winded as the trail was constructed with many switch-backs. However, because of these switch-backs there are several rather sharp/blind turns that can become dangerous as the trail activity heightens and bikers and hikers are occupying the trail at the same time. There will be signage directing traffic to reduce issues moving forward. See Multi-us Etiquette below. 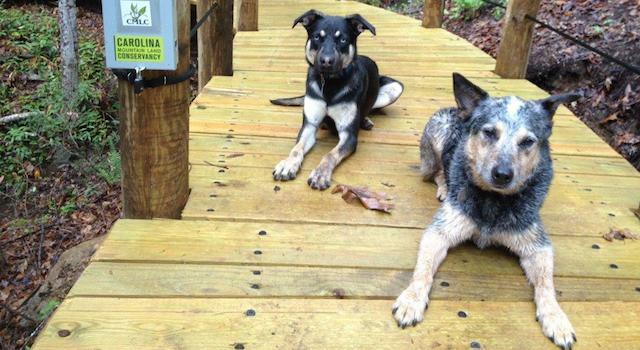 Dog Friendly: Absolutely – you technically don’t need to keep your dogs on leash – yet. You do need to maintain control of your dogs. Be aware that mountain bikers will likely pass you and everyone’s safety is at risk if your dog freaks out. There are no poop bag stations or trash cans so bring your own and carry it out. 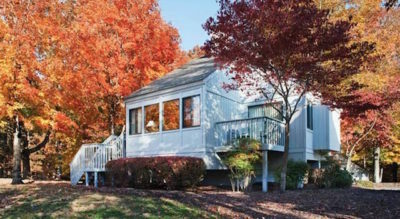 Amenities: There is a small 6 car parking area that is just off of Buffalo Creek Road. Be careful as some of the gravel areas are a bit soft/loose and Mike’s truck got stuck a bit as the tires sunk in when he was out there on another trip. For overflow I guess it would be possible to park along the road for more spaces. We didn’t see any No Parking signs. That is it for amenities at this point. The time of our hike was the end of February, 2014. At this time, the Park had not “officially” opened but was open for bikers, hikers and we even saw two climbers heading up to the boulder field. The trails are complete but Park signage had not yet been installed. The trail itself is lasso shaped. From the parking area, follow the trail head across the big bridge over Buffalo Creek. Continue about 100 yards and you will see the trail on the right. If you continue straight another 100 yards you will be in the Rumbling Bald parking area (this is a private parking area for Rumbling Bald residents). Once on the main trail, heading away from Buffalo Creek, continue on about 200 yards to the fork in the trail (this is the start of the loop in the lasso). 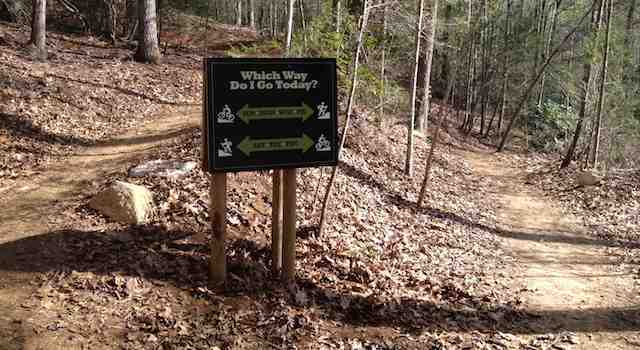 Once signage is up, bikers will be directed in one direction and hikers will be directed in the other. Please follow your designated direction as this is a safety feature to prevent collisions between hikers and bikers. OK, there are no tricks to this trail – just keep going and enjoy the beautiful scenery that “mother nature” has provided. You have been mountain biking for at least two years. 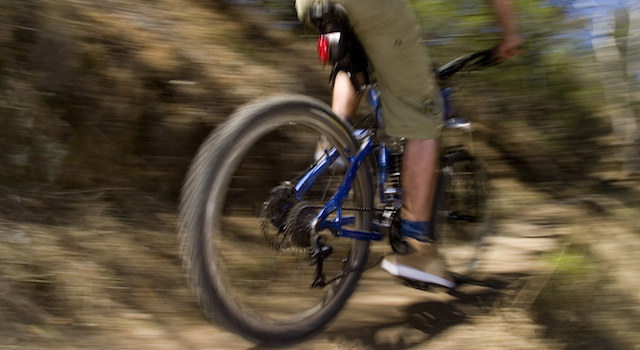 You are capable of controlling bike speed and direction on moderately steep and technical single track trails. If you are not sure of your skill level, I would hike the trail to survey the area before riding it. I would like to give a shout out to Trail Dynamics, based out of Brevard, NC, for constructing what I think is an incredible trail for hiking and biking. What’s in store for the future of Buffalo Creek Park? The next phase of the trail will head west and go 5-7 miles to Eagle Rock and have another 2,000 feet of elevation gain, which is four times the amount of the first phase at Buffalo Creek Park. This will link it to Chimney Rock State Park property. 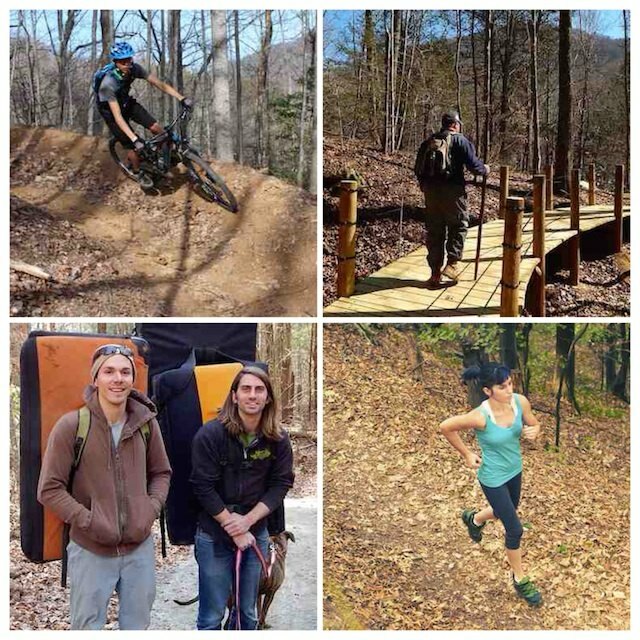 We hope you enjoy your bike, hike, climb or nature walk at Buffalo Creek Park Lake Lure, NC. Stay tuned for updates on Buffalo Creek Park and as always: make sure you leave the park as you found it so others can enjoy the park too.